Straight out of the 50’s and right onto the flight line! 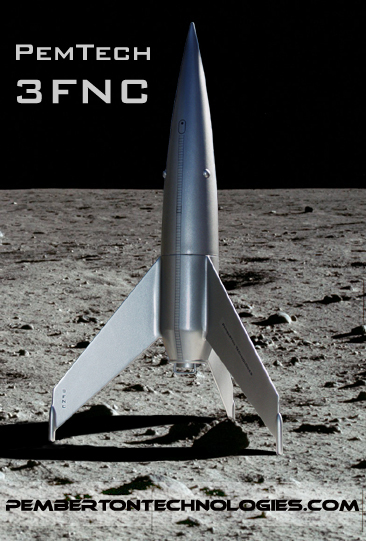 Our Team of Mad Scientists has taken the three fins and a nose cone concept to its farthest extreme with the result being our 3FNC, literally a nose cone with fins. She is a sleek, sliver beauty is everything a rocket should be: short, stubby, stylish, and light weight with rakishly swept fins tipped with cool retro, fin-tip pods. 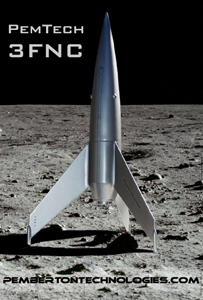 Kit comes complete with 3″ nose cone, 3″ body tube, 29mm motor mount, plywood centering ring and fins, dowel for the fin-tip pods, heavy-duty nylon chute, NOMEX heat shield, KEVLAR attachment cord, 9/16″nylon shock cord, attachment hardware, nose ballast, 1/4″ launch lugs, tail transition material and vinyl decals.